Language can be very powerful. Our choice of words can reveal a lot about who we are and what we think, feel, and value. When we talk about sensitive subjects, therefore, we tend to choose our words more wisely so as not to offend anyone in conversation. We use positive language as a means to show respect to those we are speaking with, and to establish a healthy dialogue on even the most delicate topics. This especially holds true when talking about adoption, a once-stigmatized subject that has taken great strides in recent years. For the most part, adoption language (the way we speak about adoption) has made great strides as well. In the past, adoptions were kept secret. Adopted children were asked “where they came from,” but did not know the answers. The act of placing a child for adoption was referred to as “giving up.” Most often, adoptive families were not seen as “real families” – “real” implied biological. Today, adoption is seen in a very positive light. Families grow through adoption. Expectant mothers make thoughtful adoption plans for their children. Adopted children now have the opportunity to meet or speak with their birth families through an open adoption arrangement. People are more aware of adoption than ever before, largely because it is spoken about in a more open and positive manner. Themes of adoption run in popular, mainstream television shows such as Modern Family and This Is Us. Adoption is also more common than it was in the past. In the United States, there are currently over 1.8 million children who have been adopted. Even more of us have been touched by the act of adoption in some way, knowing someone who has been adopted, someone who has adopted, or being that very person ourselves. That is why it is so important to always use positive adoption language in our conversations about the subject. As close as some of us may be to adoption, we know that we may not always speak about it the way we intend. It is common to hear the phrase “giving up for adoption” or to talk about someone’s “adopted son or daughter.” The problem is that this is negative adoption language – words that can have a very damaging effect on how others perceive adoption and how adopted children, adoptive families, and birth parents distinguish themselves. Let us use the above examples. If you are an adoptive parent and refer to your child as your “adopted daughter,” you run the risk of making her feel like she does not belong to your family. This could impact her identity and her self-esteem. If you are a clinician and ask your patient if she is considering “giving her baby up for adoption,” you will have added a very negative connotation to the act. Adoption is not giving up. Rather, it is a very difficult decision that birth parents make with thoughtful consideration of their child’s well-being and an overwhelming love for their child. Through adoption, they can plan for the life of their child, a life full of opportunity and security, a life that they may not be ready to provide. Instead of “giving up a child,” we say “making an adoption plan”. Positive adoption language should also be taken into consideration when talking to families about their children and/or their decision to adopt. For example, it may feel easy to say something such as, “It is so wonderful that you adopted. I could not raise someone else’s child,” or, “Your son/daughter is so lucky” or “so much better off with you as a parent.” These phrases are problematic because they are based on unfounded assumptions about adoption. They imply that adoptive parents are different and to be glorified over other parents. They imply that their children should feel grateful for having been adopted. They also imply that birth parents are unfit parents – all misconceptions that are commonly associated with adoption. Using positive adoption language helps us to dissipate the myths and stigma that adoption once carried, and educate others on this subject. It encourages the world to view adoption not as second-best to parenthood, but rather, as a positive option for those who cannot or are not ready to fully provide for a child. By using positive adoption language, we honor and show respect to birth parents for making a loving, courageous, and selfless choice; to parents by adoption, we validate their role as their child’s forever family; and by this, we acknowledge the child and his/her extended family. 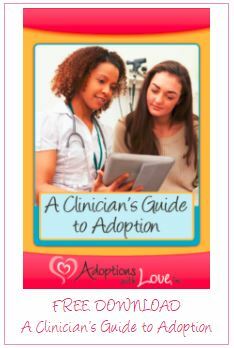 If you are a clinician looking for information on how to talk about adoption with your patients, please download our “Clinician’s Guide to Adoption” below. If you are an adoptive family or expectant/birth parent looking to learn more about adoption, please do not hesitate to call Adoptions With Love at 1-800-722-7731 or contact us here. This is a great article!!! Thanks for the important work you are doing!